January 5, 2019 .Reading time 13 minutes. This month I’ve been travelling home to Australia to visit family and friends. It’s been a strange visit, somewhat rushed, bittersweet and filled with a terrible sense of reverse culture shock. I don’t think I’ve ever felt so tired or disoriented than after going from a deep Sicilian winter into the middle of a warm Western Australian summer. My head is swimming with confusion and recalling many little details I’d forgotten. I always get this strange sense of deja vu in the first few days off the plane driving around the same old streets from my childhood. I’m sad to see many old landmarks disappear, and sometimes I struggle to recognise my old friend, Oz. This strange sense of foreignness usually doesn’t last long as I get back into a routine, but this time I haven’t been able to shake it. I’m gradually recalling what I loved about home, its landscapes, colours, the laid back and warm nature of the people and the incredible amount of space there is to create your own path. For the first time, I’ve realised how European I’ve become: small things make me cringe, I am a snob about my food, I’m riddled with culture shock, and for the first time I feel like a foreigner. But I am determined to pick up my friendship with Australia where it left off, as true friendships never die, they merely need to be revived every once in a while. Every day here I am happily breathing in the fragrances of the summer, getting a bit of a tan and merely soaking up everything around me, gathering and making new memories. This year I have had the privilege of visiting the coastal city of Geraldton North of Perth. Thanks to my sister in laws beautiful family who lives in this charming Midwestern regional city I have been able to experience this place with many insights from the locals who adore their town. Located 424 kilometres away from the capital, which is easily reached by plane in a fifty-five-minute plane journey Geraldton has a population of 37,432 people. It has a beautiful location right by the ocean and is a quirky mix of farmers, fishermen, families, miners, surfers and laid back trendy alternative vibe. The port of Geraldton is a significant link in the west coast in the major industries of the region like mining, fishing, wheat, sheep and tourism. Since 1840 ships have been tugged in and out of the port twenty-four seven and the crystal clear waters are mesmerising. The Batavia coast marina has been developed into a beautiful succession of jetty’s, fisherman wharves, yacht clubs, high rise apartments, beaches, a museum, restaurants and many other fascinating points of interest to explore. The Geraldton Foreshore is the centre of Geraldton’s social and family life. Zigzagged with cycle and walking paths it is where locals do their early morning workout, there are many playgrounds, picnic areas, beaches, cafe’s, fish and chips places and even a free water park. Shopping at Geraldton is terrific fun, there are many surf stores and trendy boutiques to explore especially along Marine Terrace. Even if you don’t buy anything a walk around the streets of the town will be filled with street art, cafe’s and newly renovated pubs and eateries to explore. The only downer to visiting Geraldton in the summer is the terribly hot and robust desert winds which literally howl through the town in the afternoons. It is much better to visit in the mild winters as you won’t be battered by the wind, or risk to be blown to one side like many of the local trees along the roadsides. The streets of Geraldton are broad, comfortable and welcoming, just like the locals. The golden sunsets are always spectacular, and the light makes it perfect for landscape photography. The place has a beautiful colonial country feel, like stepping back into time. Every photo I take has the feeling of an old black and white or sepia picture filled with character and tales to tell. The memorial of the World War two cruiser HMAS Sydney is located above Geraldton on Mount Scott. The beautifully sombre memorial recognises the loss of 645 lives in what still remains Australia’s most devastating naval loss after being sunk together with and by a German ship off Shark Bay in November 1941. The Memorial is made up of steel based on the ships original prow, a granite wall listing the names of the ship’s crew, a bronze statue of a woman looking out to sea and I dome made up of 645 seagulls dedicated to the souls of the people who died at sea. When I visited the monument, there were many people who were making the most of the scenic view from above Geraldton. A handsome couple of Indian newlyweds were having their wedding photos taken in the beautiful light, their celebration gave the monument a sense of elegance, respect and honour. What a special place to have your photograph taken. Taking a drive out of Geraldton towards Point Gregory to see a magical pink coloured lake I was reminded of the golden expansive Australian landscape which is barren and dry in the summer yet beautiful. It reminded me of the expansive golden interior of Sicily, near Enna which is like a twany coloured quilt cover with its flowing hills and harsh sunshine. Port Gregory lies near the mouth of the Hutt River on Western Australia’s Coral Coast and is home of the Pink Lake called Hutt Lagoon. This picturesque fishing village is encircled by five kilometres of exposed coral reef. Originally developed to serve the Geraldine Lead mine, the town is now a holiday hotspot for fishing and diving. 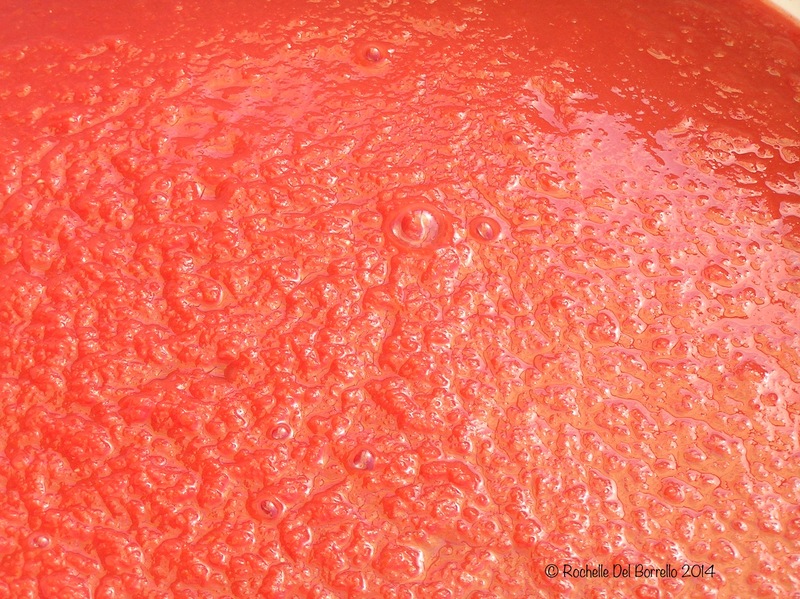 Hutt Lagoon boasts a pink hue created by the presence of carotenoid-producing algae Dunaliella salina, a source of ß-carotene, a food-colouring agent and source of vitamin A. The lagoon is about 70 square kilometres with most of it lying a few metres below sea level. It is separated from the Indian Ocean by a beach barrier ridge and barrier dune system. Similar to Lake MacLeod, 40 kilometres to the north of Carnarvon, Hutt Lagoon is fed by marine waters through springs. The intensity of the lake’s colour changes right before your eyes at times it doesn’t seem pink at all then as the desert wind begins to blow and the heat begins to burn your face the lake appears to heat up and blushes in light pink. As we stood on the banks, the lake put on a lovely show for use, blooming into a gorgeous deep fuschia colour. Driving out onto the salt flats, the pink salt surface looks like ice, crunching under your feet and caking your shoes in light salt. It is another worldly landscape, and it takes me back to Sicily once again. For a moment I find myself near Marsala on western Sicily at the salt mines. The same hot desert air whips up the salt only here at Port Gregory no colourful windmills are helping to churn out the stockpiles of natural sea salt. Overlooking the Indian Ocean, the Museum of Geraldton celebrates the rich heritage of the land, sea and people of the Mid West region. The beautiful new Maritime history museum allows you to discover ancient landforms, Yamaji history and culture, and the region’s unique natural landscapes and marine environment. The archaeological riches included in the museum’s exhibitions include details from four different Dutch shipwrecks off Geraldton’s coast (Batavia, Gilt Dragon, Zuytdorp and Zeewijk). The whole coastline along from Geraldton is littered with wrecks from the 17th and 18th centuries as the Dutch traders would travel to and from Amsterdam into modern India and Java. The story of the Batavia is probably the most fascinating of all of the wrecks, coming aground near the Abrolhos fishing islands off Geraldton the fate of the Batavia was marred by a bloody mutiny and has inspired many historians and authors with its mystery and horror. The St Francis Xavier Cathedral was designed by World renowned Arts & Crafts architect and Catholic priest Monsignor John Hawes (1876 – 1956). Construction began in 1916 and was completed in 1938. The external of the cathedral is made in a golden coloured limestone, with a distinct mixture of Australian colonial and nineteenth-century European architecture. It resembles the Spanish style of New Norcia in the south west of Western Australia. The Platform markets on Chapman road every Sunday are on the site of the original central railway station at Geraldton. 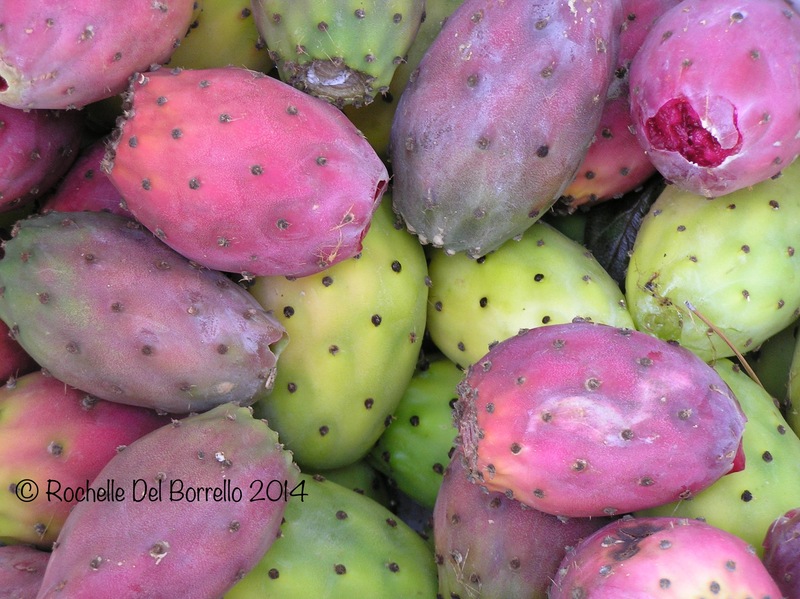 They are an excellent way of exploring the local produce and the vibe of the local people. A mixture of colour, perfumes, food and creativity a visit will give you a perfect impression of the real character of the city. It was also the place I choose to end my trip to Geraldton, casually browsing and chatting with the locals before hopping on a plane back to Perth. September 16, 2018 .Reading time 9 minutes. Every year a group from my small Sicilian town of Sinagra organises a pilgrimage to the Etnaland amusement park at Belpasso outside of Catania. In the summer months, the waterpark is open until the early evening, and the connected theme park rides are put into motion as the locals spend their evenings spinning, dipping and riding around until the early morning. This year I was swept up by the enthusiasm of my eight-year-old son, who had never been on a waterslide and was somehow tricked into wanting to relive my childhood. I remembered the wind blowing through my hair on toboggan rides with my best friend at the tritely named Adventure World, a magnet for children on school holidays in Western Australia, together with summer barbecues and walks through Kings Park, a hundred acre patch of natural bush right near the centre of the Perth CBD. I was determined to create some memories for my son, after this year’s most disappointing persistently rainy summer. I happily got up at six am, took the long bus ride, paid the exorbitant entrance fee, and made a packed lunch. The day began by dipping our feet and bottoms into the extra large doughnut-shaped floating devices which took us along the ‘slow river’ ride, gently being pushed along by the leisurely paced artificial current while intermittent water features and fountains sprayed us around the circuit. Lulled into a clear yet false sense of security we decided to test out something more adventurous. My son had seen a waterslide on the parks web page called ‘the black hole’ and was determined to have his official water park baptism on it. Now I should have guessed the true nature of this ride, by the name alone, the phrase Black Hole doesn’t precisely evoke unicorns and rainbows. But from the outside, it didn’t seem too fierce, and it resembled similar fun waterslides in Australia. While we sat down on our little double seater water raft at the mouth of the steep pitch black tube, I wondered how I would be able to reassure my son in case he becomes frightened, and I resolved to make happy, encouraging yahooing sounds on the way down. As the water rushed past us and pushed us down into the absolute darkness I suddenly remembered, I’m no longer a child and I actually hate water slides. What followed was a brief moment of absolute terror. The sensory deprivation of the pitch black meant we could not see one another even if we were one in front of each other, nor prepare ourselves for the twists, turns and bumps along the tube of terror. Needless to say, my reassuring yahoo noises were actually more like hyperactive teenage girl squeals and screams. My niece who was waiting for us near the chute’s pool heard us coming down and said my son’s frightened eyes looked as if they were ready to pop out of their orbits. The worst thing about water slides is the sense of losing control over your own movements, once you start there’s no going back, you just need to sit back and try to enjoy the ride, or in my case scream your lungs out. Then there is the sudden realisation of all the naked foreign bodies who have also sat on the same mats, seats and lifesavers as you, yes the water is chlorinated, but there is a distinct sensation of uncleanliness. Childhood is such a wonderful time when you seek out adventure, live in the moment and never see the danger. Sadly I’m no longer in that phase of my life and have become quite a snob. To my surprise, the Etnaland crowd is far from snobbish as it seems most of Catania comes here to cool off during the sweltering Catanese summer. The lava rock landscape around the city is scorching and apart from the odd swimming pool, air-conditioned shopping malls, fountain, crowded rocky beaches, and after dark piazza, there aren’t many options for cooling off, so the water park is a substantial part of the summer entertainment. Ranked among the twenty best water parks in the world Etnaland is an endless hive of activity with busloads of people coming from throughout Sicily and many families from Europe. It’s a beautiful spot for people watching, as different waves come in, strip down into bathers and head off to the rides for the whole day. I’ve never seen so much overexposed flesh in one place, it’s actually beautiful to see how so many people can be comfortable with their own bodies and its great to see this immense power for body positivity. But sun worshipers roasting their skin is actually quite unhealthy, and I felt quite overdressed with my shorts and sun proof shirt designed to protect my pale flesh from sunburn. Some habits from my Australian childhood will never grow old. On the whole, the day trip is a good family day out, the place is well organised, clean, safe and very popular. The only downside was having to wait in line for the rides, but if you are shrewd and head out to the more popular ones while everyone else is having lunch, you can avoid some of the confusion. Basically, you arrive, throw everything you have into a locker you hire for the day and strip down to your bathing suit and then crisscross the dozens of water rides and pools around the park. There is literally something for everyone from kiddy pools to rides with names like Kamikaze, Twister, Giant Toboggan, Red Cannon, Jungle Splash, Colossum and Titania. There are complimentary maps available at the entrance, so it’s easy to plan out your day. The many park employees are positioned around the place with cameras taking everyone’s photos on the rides. At the entrance to the park you are given the option to get a bracelet which is scanned after every picture, and when you are finished, you can go and see your photos at the photo booth and purchase prints for about 10 euros a pop. For those who are looking to relax on a deck chair by the pool all day you can hire a spot, buy a cocktail at one of the many overpriced open bars and restaurants. If you don’t have an energetic child dragging you around the park, you can dip into the artificial wave pool which is put into motion every hour together with an active dance party complete with twerking and gesticulating dancing girls, if that’s what you like. If everything gets too much at the end of the day there is a relaxing spa bath to massage your aching muscles, just in case you need it, there’s something for everyone really. August 19, 2018 .Reading time 8 minutes. Sitting on the bumpy, stony Sicilian beach I soak up the eccentric backdrop. This isn’t a beach; it is a rock mine, full of large pebbles, boulders and blocks of concrete dropped along the coast to create artificial barriers between the shoreline and the eroding sea. You can’t dive into the water without putting yourself in danger of serious concussion or spinal injuries, there are endless craggy boulders skulking under the water. Walking down the beach my shoes begin to fill with pebbles. As I spread out my towel, my body is roughly fondled by the intruding stones. How I wish I could be cushioned by the sand and let my feet bury themselves under fine grains. Apart from a total lack of sand, there isn’t the convenience of a single shop or public toilet. It is harsh, rugged and rustic. Watching beach umbrellas, pop up along the seaside, I begin to smear myself with sunscreen, as this is the standard procedure for people with milky coloured thighs left unexposed to the sun during winter. In Australia the sun is one danger of many to protect yourself from, an Australian doesn’t go to the beach without sunscreen nor do they go walking in long grass without boots or ever forget to check their shoes before they put them on to look out for poisonous spiders. Around me I see at least half a dozen women roasting themselves in the sun, I can smell barbecue meat. Italian women take an enormous risk during the summer, turning themselves the colour of roast chicken. The tanned look is very fashionable and according to popular logic; the darker you look, the healthier you are. Obviously, they are in denial about the existence of skin cancer. We’ve come down to the beach with a large collective group of in-laws, friends, cousins, aunts, nephews, nieces and their children. All the kids jump into the water without sunscreen. Here the sun doesn’t seem to be so harsh, you can easily stay out for a few hours and not burn to a crisp. I guess Italy is far away enough from the hole in the ozone layer to worry about the risk of melanoma. All my female companions are in bikinis and I am in a full piece bathing costume complete with short pants to cover myself from the sun and hide my flabby stomach. It’s strange to see so many women in bikinis. I’ve always been self-conscience about exposing my body at the beach, I’ve never been part of that tall tanned beach going Ozzie set. I’ve never spent an entire summer at the beach, neither am I the athletic type. These conservative Sicilian women, usually cover their bodies so carefully and fashionably during the year, yet in the summer they easily strip down without a second thought into the bare minimum of beach attire. They abandon themselves to the ideal bohemian fantasy of summer, without looking at themselves in the mirror. Italians hold their right to a seaside holiday as dearly as their right to vote. It is a sacred privilege. Those who have left Sicily to work in the large industrial cities like Milan and Turin, return every summer for their obligatory beach time. Those who live in Sicily, who really don’t work very hard during the year, at least by European or Australian standards, relax and spend summers by the sea as rigorously as those who are fully deserving of a restful holiday. Beach-going is extremely fashionable, as it was once a luxury enjoyed only by the rich and famous. Today everyone takes their little turn on the catwalk at the Italian seaside. Even on our own little-isolated strip of Sicilian coast, there are people who have convinced themselves the world is watching them in their seductively draped sarongs, strategically exposed tattoos, the latest shaped fashion sunglasses and the occasionally freshly styled hair and makeup. Everyone is ready to roast their abundance in the Siculu sunshine. Trying to be social and fit into the beach going routine, I lie on a towel under one of the many beach umbrellas, as everyone strips down, I just want to dive into the water and have a swim but obviously, it’s not the done thing. First, we must sit and catch up with the goings on at the beach and the local gossip. Not having any desire to participate I soak up the sun until a collective decision is made to play volleyball in the water to gradually dip ourselves into the sea. It becomes obvious no one is taking the game seriously, either that or I am the only one with any handball and swimming skills. The gossip continues, the ball is bowled back up onto the beach as everyone sits in the shallow waves and continues to talk. I really don’t know about any of the people featured in the current conversation. I am excluded from the intricate web of social connections and nicknames so I cannot contribute anything to the gossip session and struggle to understand the shorthand speak being exchanged. After a bit, I decide I’ve had enough and dive under the water swimming a few meters further out from the group. As I pull my head up they wave and whistle out to me, I wave back, realising they seem sincerely alarmed for my safety. I make my way back with a leisurely breaststroke to reassure everyone I’m fine and I just wanted to swim. The others are surprised at how well I move in the water and everyone said they thought I’d drowned. A collective sigh of relief is made as I promise not to duck dive under the water or to swim out too far out into the calmest sea I have ever seen. I smile to myself as I remember my childhood in Australia, every summer at the local pool had made me a good swimmer by Sicilian standards, yet in Australia, I always came dead last in any school swimming race. Italians at the beach are dispersed in small chatty posed groups, roasting and gossiping in the sun, only the children are playing or swimming. Why would someone go to the beach and not swim? I’ve been compiling a list of my fave Italian words on my phone for a while with a half-baked idea for a post, and I am grateful to this months Dolce Vita Bloggers theme of ‘five Italian words’, which has jogged my memory and allowed me to finally sit down and write about the Italian language. So hats off to Kelly from italianatheart.com, Jasmine from questadolcevita.com and Kristie of mammaprada.com for starting a fascinating conversation. This is my sixteenth year living in Italy and at last I am feeling at ease with the language. Italian has always been a challenge for me, I loved studying it as a hobby but when you jump into full immersion living in a foreign country without an expat safety net, your understanding really takes off, while the challenges with learning a second language can be frustrating. I’m still confused by Italian grammar, I always joke with my students that I am stuck in the basic present, past and future tenses, with an inability to express my opinions in the conditional or study the past in the complex historical past tense academics tend to use. Italian newspapers are a wonderful exercise in Italian language learning. Italian journalists have little in common with Anglo-Saxon ones, there is no emphasis on quick, clear and easy to understand language, reading a newspaper here in Italy is a journey into the Italian Baroque, filled with flowery intellectual prose, all quite beautiful but guaranteed to give you a headache. 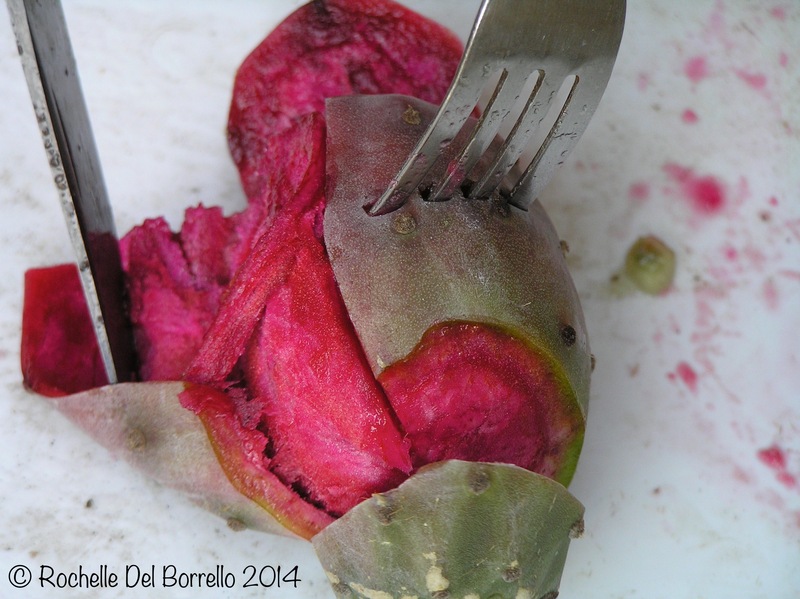 Click here if you want to read the other #dolcevitabloggers posts. I’m constantly being reminded by condescending Italians of my quaint, adorable Australian accent. While there is no class system in Italy, I think there is most certainly an intellectual snobbery which defines itself as being superior because of the ability to speak, act and sometimes even dress ‘properly’. I really haven’t studied Italian since moving here full-time. The basic grammar I have has been gained through my university studies and a few short courses during my long-lost twenties. So I have gathered this accumulation of mostly conversational Italian through years of living, working, socializing and interacting with Italians. I often challenge myself by reading a newspaper or a book and this year I am attempting to translate my blog posts into Italian but it still is a long and laboured process, which I am enjoying. I love words so when I hear something I write it down. I have loads of random lists on tiny pieces of paper, lists both in English and Italian. The Italian words are heavier, more exotic like the pebbles on rocky Italian beaches, I always pick them up, feel their strange texture, hold them up to the light, listen to their musicality and admire them. I’m going to share the first five words on my very long list of strange yet beautiful Italian words which have been created to describe quirky or ugly elements of Italian culture, words which only exist in Italian. Wonderfully onomatopoeic sounding words, who roll off the tongue, make me belly laugh out loud and leave me speechless with their aptness. The Italian language is filled with expressive words which reflect the flamboyant and poetical nature of Italy. FUNNULLONE (fan | nul | ló | ne) : the English translation of this word simply doesn’t do it justice. A slacker, bum or lay about is so much weaker than a fa (from fare or do) nulla (niente or nothing) literally someone who does nothing. Commonly used to describe and complain about government office workers in Italy. 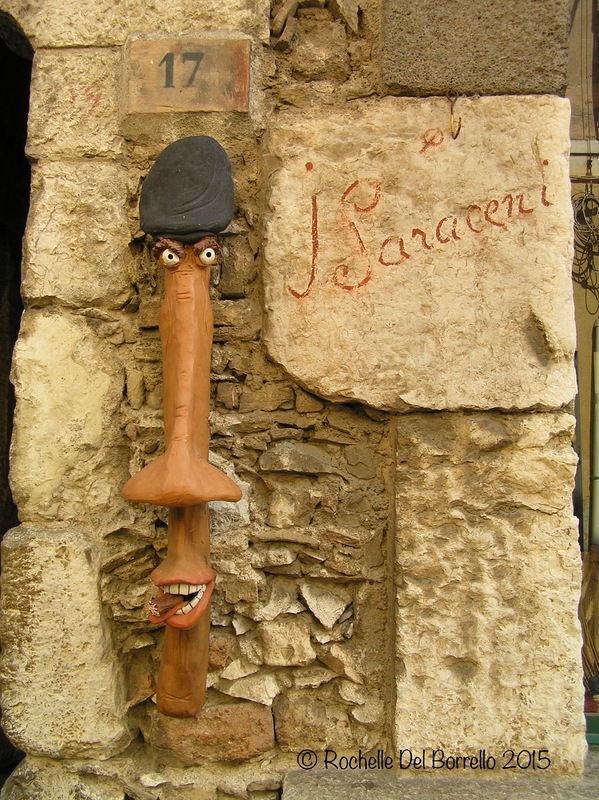 FIGURACCIA (fi-gu-ràc-cia): Italians always talk about making a good impression or a ‘bella figura,’ either by presenting themselves well in front of new acquaintances, professionally or before the general community. A figuraccia is when you make the worst possible impression, totally bombing at a job interview or burning all bridges for a promotion, you have totally ruined your reputation forever which is probably the worst thing ever for an Italian. MAMMONE (mam | mó | ne) : literally a mammone refers to a large mothers breast, a wonderful image which describes the typical Italian mummy’s boy. A word of advice, if you ever meet a mammone, don’t ever get involved with him, it always gets too Oedipal. IMBROGLIONE (im-bro-glió-ne): the English translation into ‘trickster’ waters down the meaning of this term. An imbroglione can be a nasty corrupt politician, a sly con man or an oversexed Don Juan, someone who lies and deceives for their own personal benefit, but its more than that, they are absorbed by their own deceit and are one hundred percent consumed by their own lies. GATTOPARDISMO (gat-to-par-dì-smo): a simple gattopardo is an ocelet or wild cat but after the publication of the Sicilian historical novel of the same title by Giuseppe Tomasi di Lampedusa in the 1960’s, Italian journalists invented the word gattopardismo to describe a nasty trait of the historical Italian political, aristocratic and business class. It refers to the period of Italy’s unification where basically the royalists and the upcoming middle class took advantage of political change to grab onto the power and wealth left behind after the formation of the new Italian republic. Today it refers to a certain social, political and economic class who will do anything to hold onto their power or wealth and is a synonym for the corruption and nepotism which mars Italy today. The Italian language is beautiful, even when describing the lesser attractive elements of human nature and above all it always has an honest and down to earth approach to interpreting the world. Honestly, it is this what makes me fall more in love with Italian every day. To read all the other posts about Italian words for May 2018 click here. June 10, 2015 .Reading time 5 minutes. So it really doesn’t matter if you can’t track down your favorite candy bar or if they do things differently here. Italy is an old country so things are kinda slow, it will be dusty and a little dirty but that’s to be expected. Nothing is going to be like home so go with it, embrace the difference, stop swiping your smartphone and savor life the Italian way. You will be stepping into another magical world embrace the change. Try to eat, live and drink like the locals, even if you don’t usually drink wine or eat pasta, forget all your diets, leave the beer behind for a bit and be like an Italian. Try each regional and local speciality from fresh pastas, cheeses, cold cuts, breads, drinks and desserts. Just live in the moment and stop being uptight, don’t program every moment just allow yourself to explore and discover Italy, walk around, observe and be open, this country is filled with surprises which will astound you. If you don’t want to feel out of place or get stared at. Italians are impeccable dressers and so hot pants, wife beaters and skin tight jeans aren’t going to cut it. Dress neatly, do your hair and try to look smart. I know it will be hot in the summer too don’t strip off your clothes, it is not suitable. If you intend to visit important attractions and churches, bring a scarf to cover bare arms or legs, it is only respectful. Your dress will also identify you as a tourist and could make you a target for pick pockets, shifty souvenir vendors and horny Italian men who can be a little aggressive. What can I say? Italians are superficial, they can read a lot about a person by their dress, so make an effort and you will fit in better and feel a little more fashionable, it is worth the effort. Or without the pain of having to track down an American Express office for travelers cheques, try taking money out from an ATM, you will be charged only for using another banks ATM but it is handy. Talk to your bank about it. It is always a good idea to take some cash as some places don’t accept credit cards. You say ‘Buongiorno’ (in the morning) / ‘Buonasera’ (in the afternoon) and ‘Grazie’ all the time. Be polite rather then friendly, Italians will appreciate the effort. It would be nice if you try to learn a little Italian, just the basics even if you study a phrase book or download a couple of podcasts to listen to on the way to work a few weeks before you leave. It is amazing how friendly Italians can be when they see you are trying to experience their culture and country by attempting to speak in their language. I think Italians get a bad wrap for being arrogant to tourists but often they have seen so many tourists come through who simply don’t say ‘grazie’, try it and you will notice. Having a basic vocabulary will help you navigate Italy better and understand more of what is going on around you too. April 30, 2015 .Reading time 5 minutes. 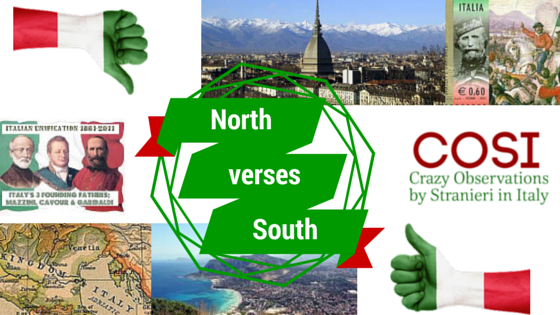 Yes, there is a difference between Northern and Southern Italy; in fact, it took a major political and social movement to merge the different states of the Italian peninsula in the nineteenth century. The process began with the Congress of Vienna at the end of Napoleon’s reign in 1815 and continued with various revolutions and internal conflicts to finally proclaim Rome as the capital of the Kingdom on Italy in 1871. The reason the ‘Risorgimento’ period took so long to put Italy together is simply because each Italian region is really so unique, even today there is a strong cultural individualism which makes it difficult to group Italians together. 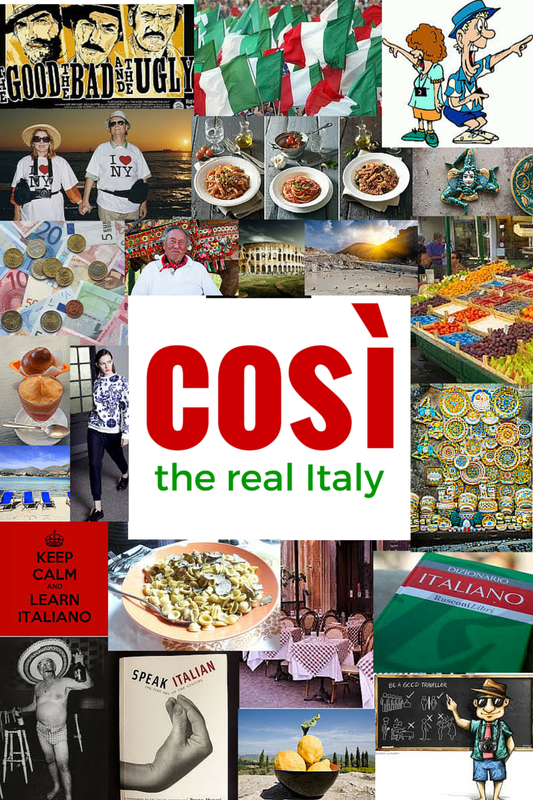 It may be a pithy example but just look how each region has its own different cuisine each town has its own type of pasta, wine, cheeses, festivals, traditions and even dialect. Italian dialects are not simply variations in accents they are different languages, so its normal there is going to be some cultural conflicts there. A personal example of mine are my own parents, my Dad was born on the Adriatic coastal town of Vasto in the Abruzzo region of central Italy and his dialect is heavy with Croatian and Greek influences. While my mother, born in Sicily and speaks a dialect peppered with diverse influences from Arabic, Turkish, Norman and German (Sicily boasts thirteen distinct foreign dominations in their history each of which has left its mark on the Sicilian language). So if my folks speak their dialects they won’t understand one another, even if standardised Florentine Italian is taught in the schools, dialects are strong in the homes and Italian is spoken with deep regional accents. Italians are staunchly parochial, the phenomenon of Campanilismo is an important aspect of life in Italy it creates a sense of identity, pride and belonging to the place of your birth with a pinch of local rivalry which is stronger than any sense of national identity. The geographical isolation between one town and the other thanks to the Italian Alps doesn’t exactly help with unifying the various subcultures and actually magnifies the Italians sense of distance from their compatriots. I am constantly bemused when Sicilians compare cities from different parts of the same province as if they are talking about two different countries. Northerners are cold and calculating. Southerners are lazy and corrupt. Northerners are efficient and money hungry. Southerners are inefficient and poor. In reality, these problems exist in both the North and South and such generalisations are nonsense. Matteo Salvini the ultra-conservative and current leader of the Lega Nord political party is a creation of the Umberto Bossi separatist movement of the 1980’s/90’s which attempted to cut Italy into two pieces. According to the Lega the South has sponged off the North’s industry and would be better off without them. 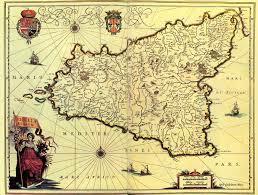 On the flip side Raffaele Lombardo’s independent Sicily movement was seeking the succession of Sicily from Italy after centuries of underdevelopment on the island. Neither has succeeded in their bids, Salvini recently trawling Sicily for votes in the next upcoming election and Lombardo is being dragged through the courts on corruption charges. Italy is such a rich place which has been inhabited by human beings since Palaeolithic times, each generation layering itself upon the one before, creating endless complexities which link Italian together and create a rampant form of individualism associated with closely linked communities and families. The North versus South debate is a result of this complex tapestry. March 18, 2015 .Reading time 1 minute. My friends and family think I am totally insane to be living my life in Italy, they are waiting for me to come to my senses and move back to Australia, like I’ve been playing around for the past decade of my life. The truth is it’s been more than chasing a dream, I’m not bathing myself under ‘the Tuscan sun’ or running a bed and breakfast in Puglia. 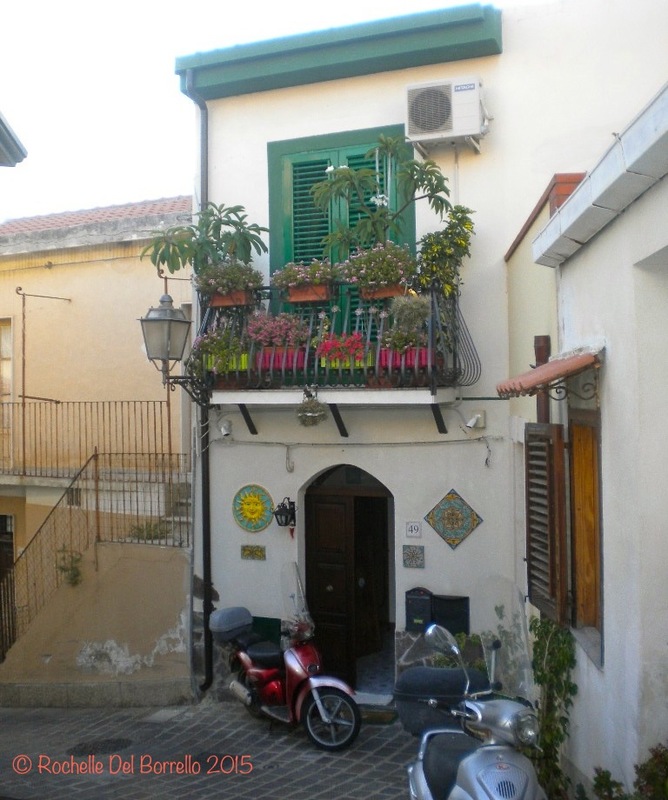 I live in small town Sicily which at times is trying for my patience, challenging for my sense of space and privacy and above all it comes with an entire spectrum of misunderstandings and culture shock with whoever is around me. So why do I do it to myself? Because Italy talks to me, it whispers sweet nothings into my ear, makes me laugh as loud as I ever have, it allows me the time to write, smell the pasta sauce on the stove and taste life. Italy has infuriated me as much as it has made me fall evermore in love with it. Moving to Italy has changed me, it has made me let go of many unimportant things, life here is more authentic, a simple less cluttered life which speaks to me louder and clearer than anything else. December 5, 2014 .Reading time 10 minutes. I have been dipping into Distant Drumlin a blog by Karolyn Cooper for quite a while now as there is a fascinating journey behind it and Karolyn has led me into the world of many other excellent international expat experiences and bloggers. The creator of Distant Drumlin returned to the UK after living in India and China for an extensive time a return journey which has open her eyes to many finer details of life back in her home. Today she splits her time between her city home in Marylebone, central London and her country home in County Down, Northern Ireland. It was great to shoot a few question over about her experiences as an expat and blogger. You have returned to the UK after living in India and China. How long where you living overseas? 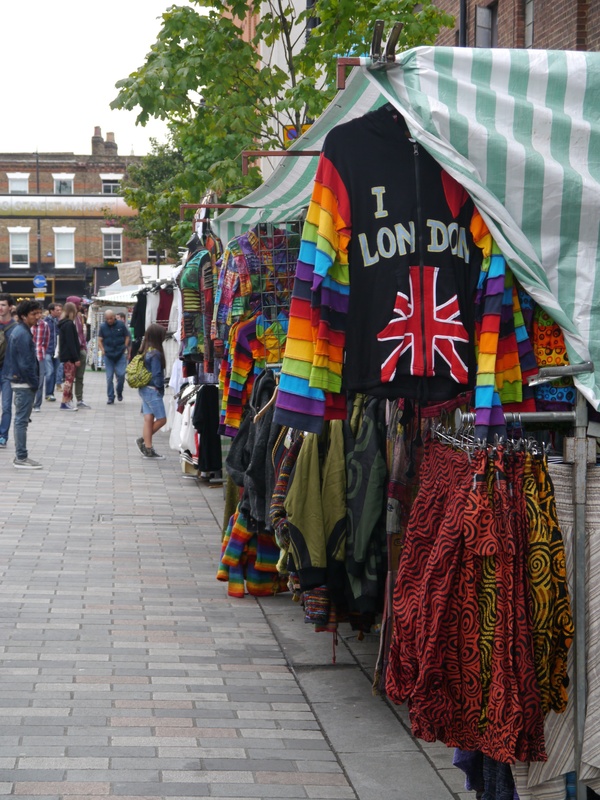 And how have you found this ‘reverse expat’ experience, was it difficult to get back into the swing of life in the UK? My husband had a role in a large company managing software developers in China and India. I quit my job in London and joined him. We spent most of the last ten years overseas, first in Dalian (Liaoning Province, in the cold north­east of China), then Shanghai (warmer), then Bangalore (finally, blue skies and tropical sunshine in south India) . At the end of 2013 we came back to the UK. We’re happy to be back home. Name five things we should see and do in India and China based on your experiences there? See the fireworks at Diwali in India, and then see how they compare to the New Year fireworks in China. Do some yoga in India, compare with tai chi in China, see which makes your leg muscles ache more. Learn how to use chopsticks properly: it’s easy! What should I defiantly taste/eat in India and China? In India, you must taste the mangoes, bananas and cardamom. I thought I knew those flavours, but they were so much more intense in India. In China, try everything unless it’s still alive (drunken prawns) or cruel (shark fin soup). You never know, you might love the jellyfish and Shanghai dumplings (I did) or the sea urchins and sea cucumbers (I really did not). Now getting back to your present situation, if I was coming to you to do this interview where would we meet and what would we be drinking? Well that depends on whether you catch me in the city or the country. There’s nowhere finer in Northern Ireland than my own garden with a view of the County Down countryside and the Mourne Mountains, so I will make us a pot of tea. 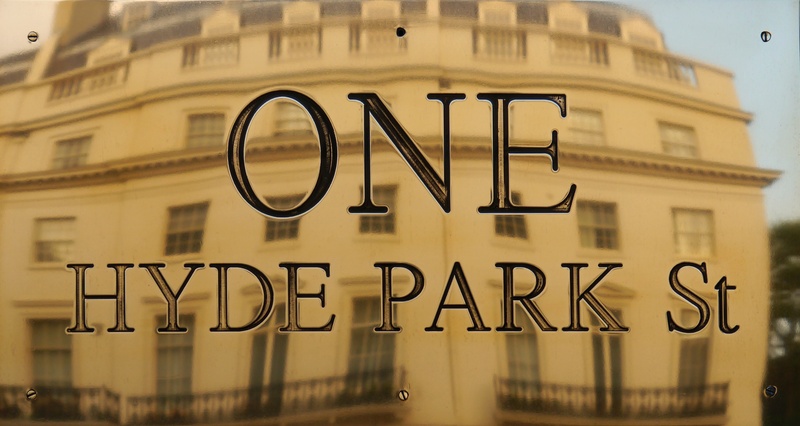 If we’re in London, let’s drink espressos at one of the trendy Marylebone cafes. Do you ever miss your expat experience? Did you have much of a problem with learning the language, what advice do you have for English speaking expats? In India I didn’t learn anything, except to distinguish which of the local languages I was failing to understand. I am equally clueless in Tamil, Telugu, Kannada and Hindi. We were much better in China. My husband and I both took lessons in Chinese. Our first teacher gave us a good grounding in Pinyin. That allowed us to learn some basic vocabulary. Then we learned how to look up Chinese characters in a dictionary, using the radical and the number of strokes. Those skills demystify Chinese…slightly. It’s still a hard language for English­speakers to learn. I learned Chinese vocabulary best when it came as part of a whole phrase that I could repeat, parroting the correct tones….so I am a fan of DVDs and podcasts. And the words that stuck best came with some emotion. Play a sport, and you soon learn to count the score, ask for the right golf club, and call shots in or out, just because you really don’t want to lose the game. What do you appreciate the most about the UK now that you’ve been away from it? And what do you dislike about the UK and would change in an instant? After eight months back home, I still appreciate clean water and reliable electricity. What would I change in an instant? Dark, grey, damp days. 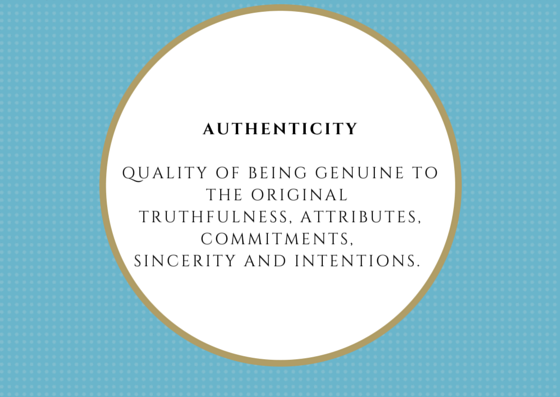 What kind of blogger are you is it all about having a zillion followers or is it therapy? I only had a zillion followers on one day, when a London college publicised the blog to the zillions of students who attend the college. The excitement wore off when none of them came back for the next post, so now I’m back to blogging as therapy. It started as an expat blog, as a way to keep in touch with family and friends when I moved to India. I was enjoying it too much to stop when the expat posting ended. Most of my posts are photo–heavy, light on text. You always have the best shots on your blog, so tell us what camera do you use and perhaps a little advice on how to get a decent photo. I love taking photos for the blog, because there’s no pressure. You’ve never seen my photos of the pheasants who live on our farm, because the birds flee from me every time. I only post photos on the blog when I’m proud of them….I don’t announce them in advance. Sometimes the iPhone is good enough, but I also have a Panasonic Lumix G3 and a Nikon D90. The Lumix is the best for blogging because it’s so small, and easy to carry around. I often wish I had taken more time over my photos. If someone­ my driver in India, my family or friends – is waiting for me, I rush to take a few photos and move on. When I’m in London, I fear that people will think I’m odd if I stop in the street for too long with a camera. But I’ve learned the hard way that it’s always worth taking another minute to get a better shot. Unless you’re looking for pheasants, in which case it’s too late. I’m in the middle of reading “The Old Ways” by Robert MacFarlane – a wonderful book about walking. For China, Peter Hessler’s “River Town” was my favourite. For India, Katherine Boo’s “Behind the Beautiful Forevers” is impressive, but will make you cry in its depiction of life in the slums of Mumbai. And the best recent book about London, with the longest title, is Craig Taylor’s “Londoners: The Days and Nights of London Now ­ as Told by Those Who Love it, Hate it, Live it, Left it and Long for it” . 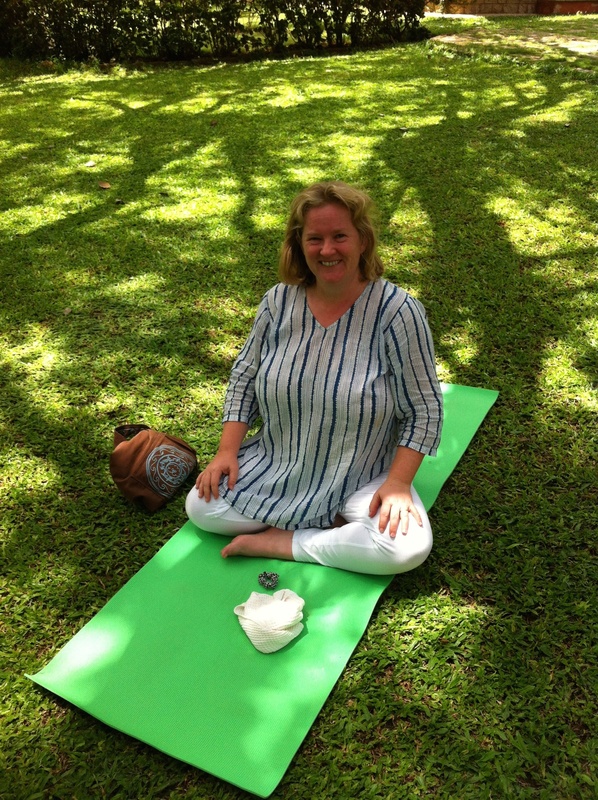 Kim is an American woman living in Fiji with her family, blogging about the animals, plants, people and culture of Fiji. The blog is called Flora and Fauna Weekly Report. The content is so much more interesting than the title! Weekly posts keep the whole thing fresh, and Kim’s photographs bring it all to life. Cheers to Karolyn for taking a moment to answer some questions and the lovely images. Be sure to pop over and see her at Distant Drumlin for some fine images and reflections on life in the UK. If you want to see more of Karolyn check her out on Twitter and Flickr . November 12, 2014 .Reading time 2 minutes. The fertility of Sicily’s volcanic soil is well-known and thanks to the Sicilian habit of having a vegetable garden I’ve never been without fresh fruits and vegetables to prepare throughout the year, from eggplants, capsicums, chili peppers, basil and tomatoes in the summer to peas, potatoes, pumpkins and broad beans in the winter. There is always something fresh to sample in the Southern kitchen. 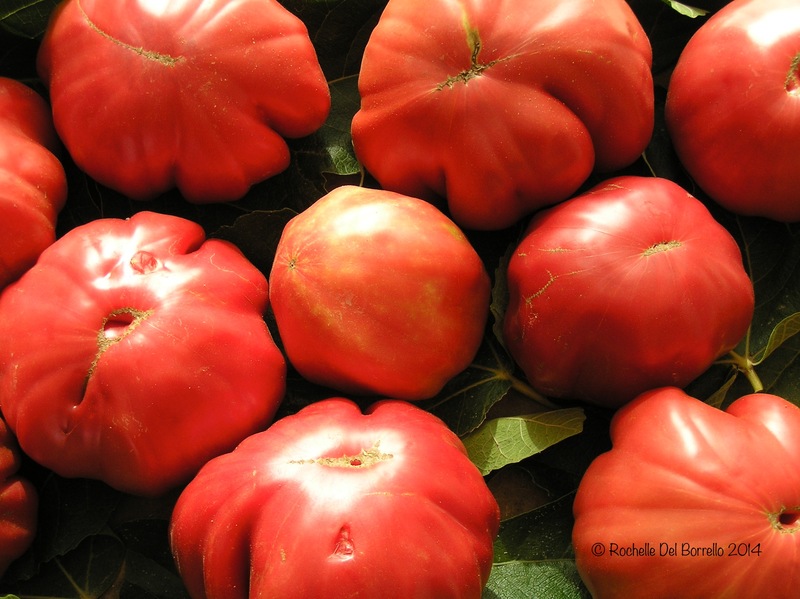 This year the seasons were quite late and the heat lasted well into October so we had a late yet bumper harvest of tomatoes, which has been both a blessing and a curse. 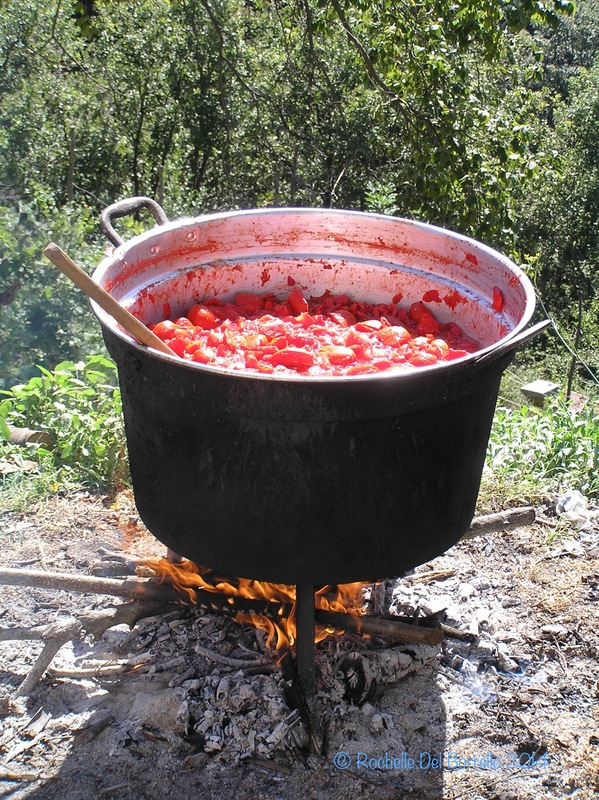 It means we are still collecting fresh tomatoes for a salads and enjoying fresh pasta sauce, now in early November but to be honest we are a little tired of these darn tomatoes. 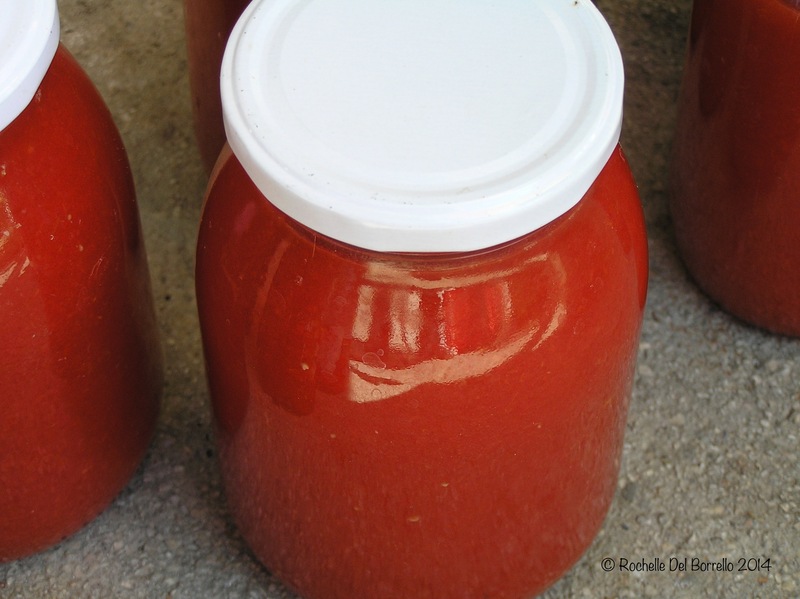 We made enough tomato preserve and bottled sauce to last two years, from peeled whole tomatoes, sun-dried tomatoes, we even roasted them as a side to barbecued meat and filled every-single glass bottle, jar and container we had in the house the last lot went into plastic water bottles and frozen in the freezer as we had no where else to put it. 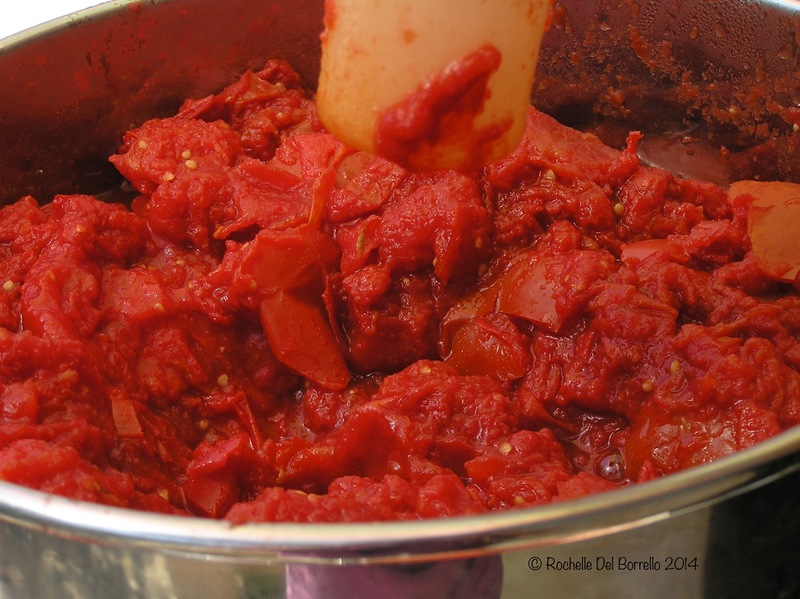 Like most people of Italian descent I grew up peeling, boiling and bottled tomato sauce every summer and everyone has their own time-tested method and recipe. the clean bottles are filled and boiled to preserve the flavor of the summer. November 8, 2014 .Reading time 15 minutes. There is no doubt that expat blogs from Florence are probably the most popular around, there are literally hundreds of them, but there are few which are able to make themselves stand out and original like Tiana Kai in Florence. Tiana combines her love of travel with her curiosity and knack with photography to explore Tuscany, Italy and Europe at large. I was surprised when she managed to find a moment in her busy schedule to answer my questions and I am happy to share our conversation with you all. Tiana’s faithful bike Valentina enjoying the a Florentine icon, the Ponte Vecchio. Do you consider yourself an expat and if so did you make a conscious decision to live the expat life and how did you end up living in Florence Perhaps you can describe exactly where are you living in the city? Well, I’m definitely not a local, so expat, immigrant, visitor all work! I have been living in Florence for two years now. I rekindled with my ex (a Florentine) whom I dated back in the US from 2001-2003. We got back in touch and next thing I knew he bought me a ticket to visit him for two weeks. The rest is history! How would you describe Italy to someone who has never visited? Are the people welcoming to foreigners? Oh wow, what’s not to say? The coast, the mountains, the land, passion, food, wine, vineyards…I can go on and on. Every corner is picturesque and every passerby is a moving piece of art. I think Italians are very welcoming. I travel a lot around Italy and the people I meet are so incredible, open, fun and curious. Sure, Americans are easier to get to know, but so are Italians if you are willing to open yourself up. Name five things I should see and do in Florence? Climb the Giotto tower to see the incredible view of the city and an up close shot of the Duomo. Walk up to my favorite viewpoints: San Miniato al Monte Church and Piazzale Michelangelo. The best time is right before sunset—linger around for a few hours while the pink hues seep in. Tour the many gardens! My favorite is the small rose garden inside Boboli Gardens and the Rose Garden to the west of Piazzale Michelangelo. There are so many that I still have a few on my list to see. Visit a fashion museum besides the Uffizi, I prefer Ferragamo’s museum to Gucci’s. Eat like crazy! Grab a panino at All’Antico Vinaio, snack on a lampredotto sandwich on the streets, rip your teeth into a bistecca fiorentina and have wine at Il Santino. What should I taste or eat in Florence? As mentioned above you definitely need to eat a bistecca fiorentina. Juicy, raw and flavorful. Finish dinner with a light dessert like Vin Santo (dessert wine) and cantucci (tiny biscotti) dunking the cookies into the wine for an excellent finish to the evening. Gelato, yay! There are a handful of artisan gelaterias who always have a changing menu depending on the season, so you’ll sure find unique and unforgettable flavors. If I was coming to you to do this interview where would we meet and what would we be drinking? I would meet you at Il Santino. I have tried many bars around town, but this place feels like home to me. It’s small, the owners are cool and the quality of the food is unsurpassable. You are originally from the States and are now living full time in Italy, is there a terrible culture shock or do you find your culture has something in common with your current adopted home? I find a lot of things similar to life in Miami since Miami is not really “America”. That being said, Italians are still different from Latin Americans, so there was a bit getting used to. Getting things done, paying pills, stores closing for lunch where the main issues I noticed. I used to kiss everyone once when I said hi and bye, now I kiss twice when I say hi…not always goodbye. There are many tiny details that I have shifted in my life now that I live in Italy. Do you ever suffer from homesickness and how do you cope with it? As close as I am to my family I always enjoyed being away and doing my own thing. The main things I miss are close friends from the States (thank God for Skype and Facebook) and my two little brothers. I have two older brothers too, but my heart just melt for the youngsters—they’re practically my babies. Being married to someone I’ve known since I was 20 helps since I feel like I can talk to him about whatever’s on my mind and no one knows me better than he does. Having close girlfriends never hurts either when you need someone to listen to you and who knows what you’re going through (expat-wise or not). What’s been the most rewarding/high point and then the most frustrating/low part of your time in Florence? High points have been settling in and feeling like myself here—routines can help! I’ve been busy getting to know people and traveling, so that’s kept me happy and busy. Low points were more in the beginning when I didn’t know which new “friend” to trust and spend my time with, and the let’s not forget the legal paperwork which is always a dream! What do you think about the expat life? Why do you think so many people choose to be expats? Some people may think that life is better somewhere else, that they need a change. Others see it as an adventure to share with their partner or on their own, living a life dream and good for them! I think everyone should live abroad at least once in their lives to see how other people live and gain other life experiences. Growing up in Miami I always met people from other countries and thought it was so amazing that they packed up and took a chance in a different country. Ha, I’m bad at practicing! My husband and I speak English since he’s amazing at English and we met speaking English. I speak Italian to locals, but I find it incredibly odd to speak Italian to an American. I had a blog in Miami a year or so before I moved here focusing on my business and Miami happenings. Once I moved here I noticed an intense social media presence from other expats and travelers, so I wanted to share my story with them and most importantly with my family and friends back home. My blog is a place where you can find tips about Italy and my personal experiences with many many photos! When someone is coming to Florence I want to provide them with the best of what they can do and EAT, so that they have an incredible time here. 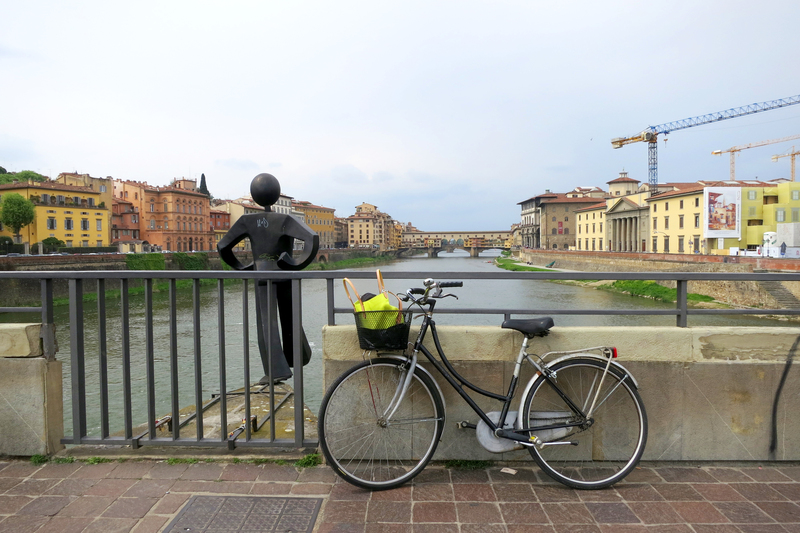 Since I’m more than just someone living in Florence I like to focus on other travels and expat life in general, so you’ll find a few things that may connect to you on a personal level. Have you ever had negative experiences with blogging? Tell us about it, how did you handle it? Maybe a few pompous comments, but I always think that they must not be very nice to anyone not just me. What kind of blogger are you, is it about getting a zillion visitors/subscribers, selling your books or is it all therapy? I let blogging take me where it takes me. I don’t want a blog filled with advertising and I don’t want to over sell myself, so it’s more about my stories and photography. Many use it as a business and for now I use it as a great tool for work, travel, keeping in touch and sharing my tips and experience with whomever is reading. Who knows what future plans I may have for my blog down the road. You have quite a good following on your blog, any advice for the rest of us? Connect with others and be yourself! I have a Canon Rebel that doesn’t always see the light of day because of the size, so you’ll find me with my Canon Powershot and iPad mini. The mini takes pretty great shots, less pixelated (and lighter!) than the iPad 2.
life without it is bleeh. Camera, iPad mini, Tod aviators, comfy loafers/walking shoes, my grandpa’s gold bracelet. Born to Run made me want to explore more of the southwest of the States/Mexico. That book was incredible and if I didn’t give it to a friend I would read it several times over. The landscape in the book really spoke to me, I wouldn’t mind spending a few nights there in the middle of nothing with my husband, dog and camera. I grew up traveling a lot and no matter how fancy shmancy the hotel, my family always was extremely active, so I really love doing something sporty and getting dirty! So what’s coming up on Living in Florence that we can look forward to …. Have you discovered any other wonderful travel/expat or writing blogs that we should be reading? I’m focusing on some side projects that let me be creative and challenge me a bit. As for blogs that I read, I actually read more about marketing and technology, but I find that I’m always cracking up when I read Married To Italy! 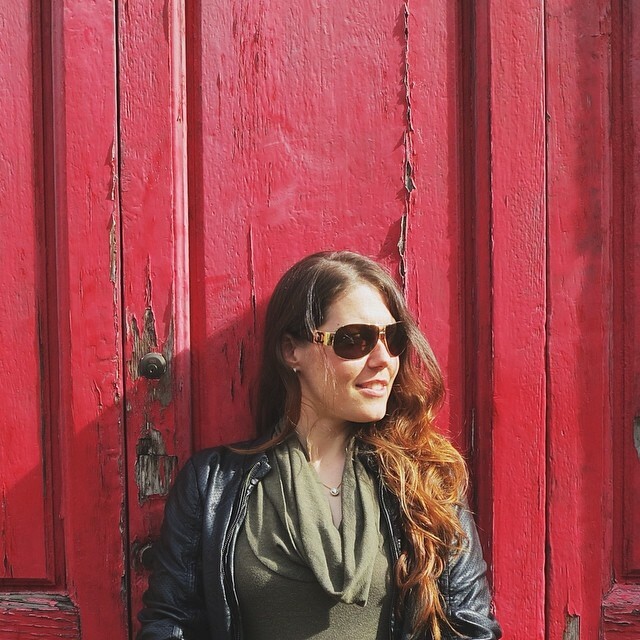 Tiana was born in Hawaii, raised in Miami and now lives and works as digital marketing consultant in Florence. 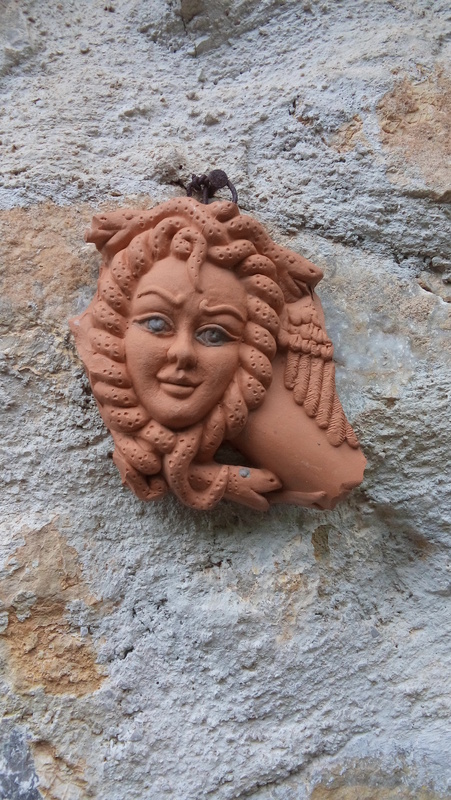 TianaKai.com shares travel tips all over Italy and abroad plus expat experiences that are sure to make you laugh. Her main passions besides travel are photography (check out instagram.com/tianapix), her yellow labrador Macintosh and her husband who cooks some mean ribs. If you want to see more of Tiana check out her social media links: Instagram, Twitter, Facebook and Pinterest and her really fun photographic project NOT MY NONNI which offers some candid images of elegant elderly people in Italy also on Instagram, Twitter and Facebook. It was fabulous to have Tiana Kai from Living in Florence to visit on Unwilling Expat and I look forward to her insights on life from one of my favorite parts of Italy. October 31, 2014 .Reading time 2 minutes. November is a sombre time in Sicily, traditionally it’s not all jack o lanterns and candy rather its about taking flowers to the cemetery and lighting artificial lights instead of candles in memory of the dead. All souls and dearly held saints are prayed for in religious services in the Roman Catholic church and the autumn signals the beginning of winter. Sicilian’s make the rounds of the graveyards with chrysanthemums cradled in their arms, paying floral homage to their ancestors and placing light globes around the edges of tombs. 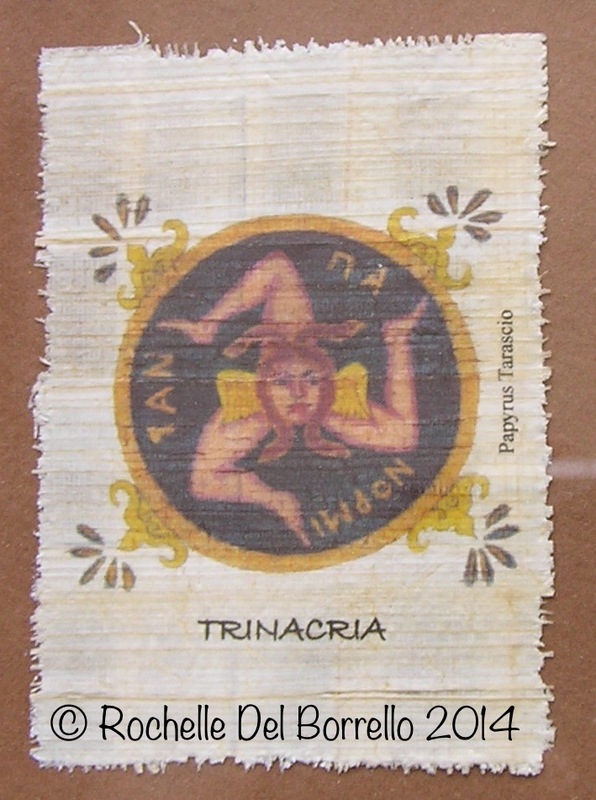 Trinacria’s necropolises are decorated by the living as the photo’s of the dead demand it, the images on each tomb and mausoleum plea to be acknowledged. Each photo has surreptitiously robbed a piece of their soul imprisoning their glances in an eerie reflection of life. 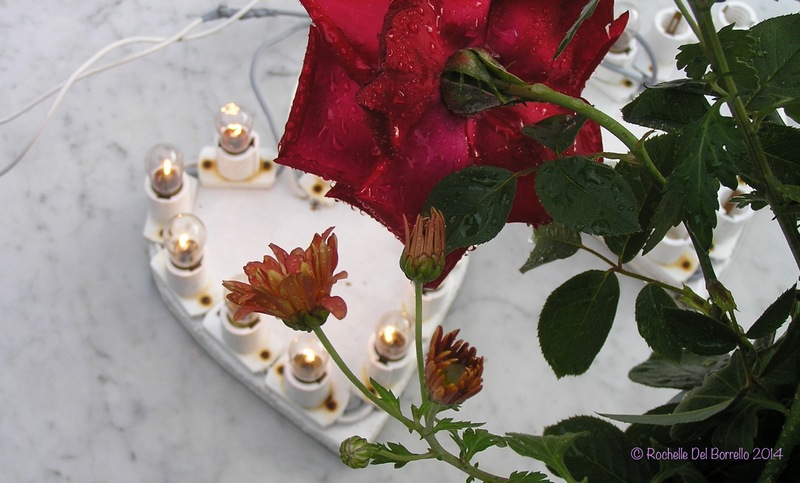 As we honor our deceased in among flowers dampened by the rain and hazardous electrical wiring, we secretly utter a prayer for those we love and hope not to be accidentally electrocuted. – Elizabeth Barrett Browning: Sonnets from the Portuguese. 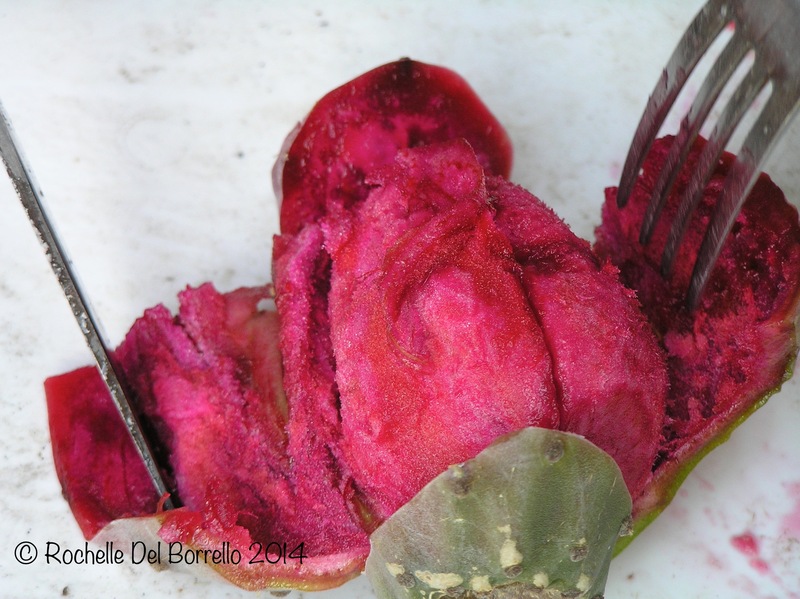 The exotic prickly pear (fico d’india) is a delicacy in Sicily and thrives around the entire island. 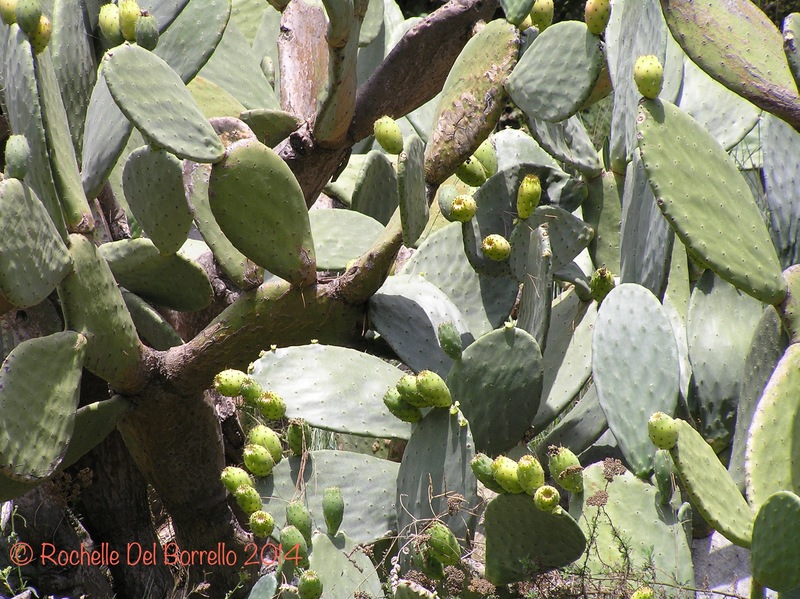 Known also as the Barbary fig (opuntia ficus-indica) it is a species of cactus cultivated throughout the world in arid and semiarid areas and is thought to be native to Mexico. 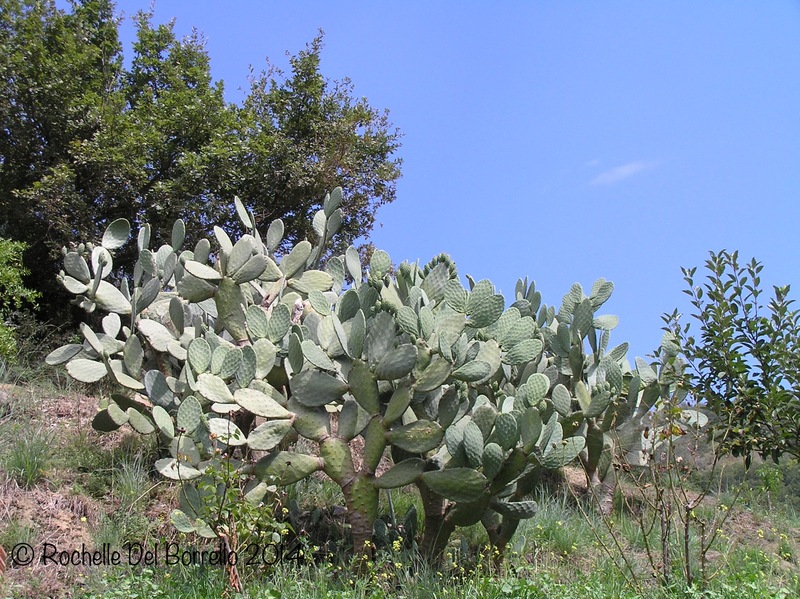 It is best to taste them after the first rains as the plant soaks up the water immediately which fattens the fruit beneath a tough prickly exterior. But how do you get to the fruit? Good question. First you climb up here. Then you pick one of those oval-shaped spiky balls with a special contraption which is a steel cup fastened to a broom handle. You put the fruit in the cup and snap them off at their base. And with some good gloves try your hand at peeling them. Warning peeling these little beasts is not for the faint hearted if you get a splinter they hurt like hell and are real buggers to get out. 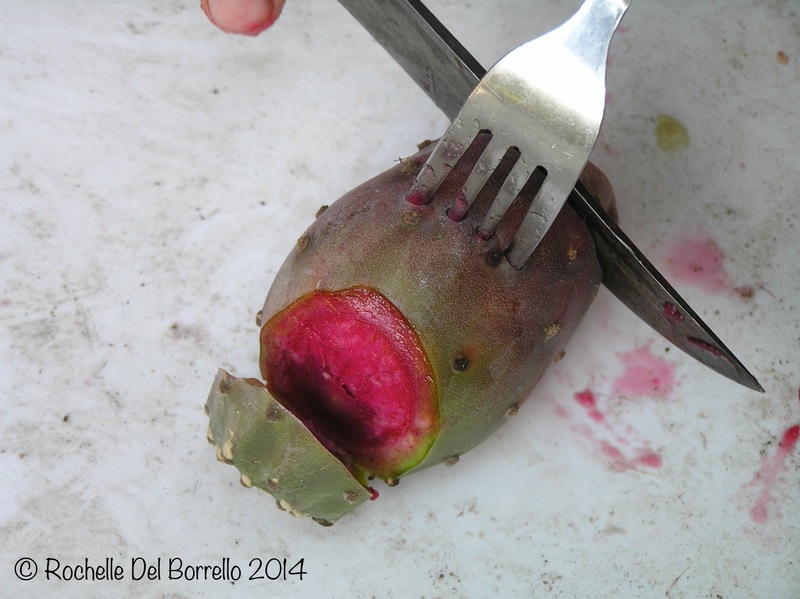 On a flat surface with the fork firmly holding the fruit you cut almost all the way through on the ends. Making a slit down the middle beside where you have the fork you can push the skin back with the knife and fork. They are best served fresh so allow them to cool in the fridge. Their taste? 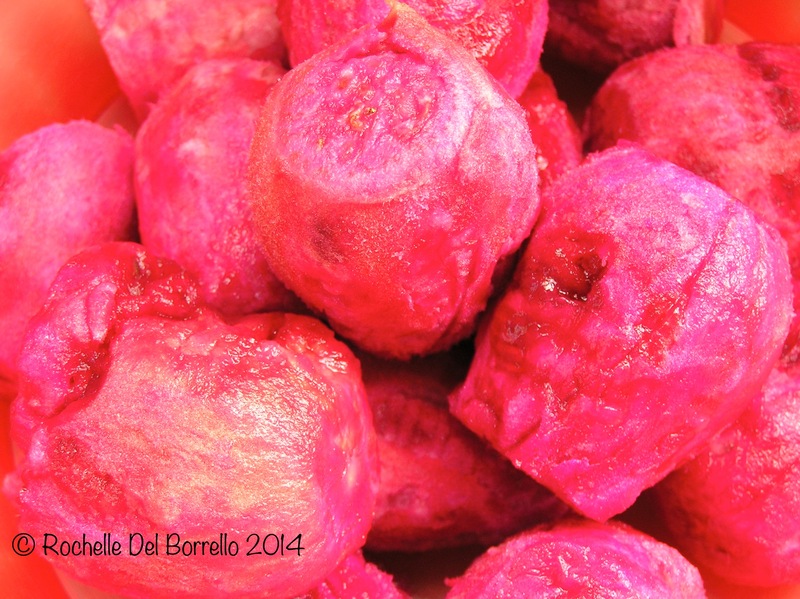 They are filled with hard little pips but the soft flesh is quite refreshing and sweet like a melon. There are many varieties the red ones are the most vibrant but there are also orange, green and so-called ‘white’ ones which are a golden colour. I’ve seen fico d’india ice cream, sorbet and even liquor so the fruit seems quite versatile. The taste is pleasant but I’d really love if someone could take out the pips for me please! Sicilian’s don’t seem to be bothered by them swallowing them without a second thought. Also don’t go eating too many of them as they have the sneaky habit of making people painfully constipated. My husband is always telling me about the time my father in law (bless his soul) ate ten fichi d’india and ended up in hospital. So go easy on those fichi!